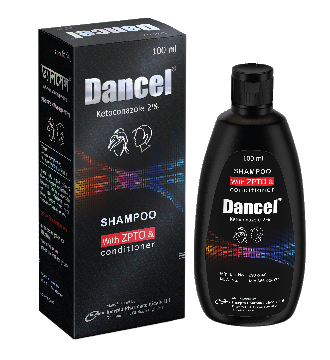 Dancel Shampoo: Each gram shampoo contains Ketoconazole BP 20 mg.
Ketoconazole, a synthetic imidazole dioxolane derivative, has a potent antifungal activity against dermatophytes, such as Trichophyton sp., Epidermophyton sp., Microsporum sp., and yeasts, such as Candida sp. and Malassezia spp. (Pityrosporum spp). Ketoconazole 2% shampoo rapidly relieves scaling and pruritus, which are usually associated with Seborrhoeic dermatitis, Pityriasis capitis (dandruff) and Pityriasis versicolor. hair, a discoloration of the hair has been observed with the use of Ketoconazole 2% shampoo. the shampoo enters the eyes, rinse immediately with plenty of water. Pregnancy Category C. Since Ketoconazole is not absorbed through the skin after topical application, Ketoconazole 2% shampoo is not contraindicated in pregnancy and lactation.